The diodes on most LED-powered lamps are hidden from sight behind plastic or metal—after all, not everyone wants to see the electronic guts of their devices. 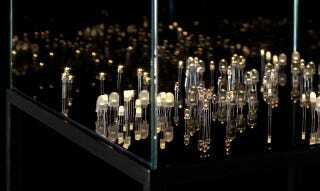 But after a look at these beautiful lamps made from hundreds of raw diodes, it's hard to imagine covering them up. Human Since 1982—aka the German-Swedish design duo Per Emanuelsson and Bastian Bischoff—debuted the lamp at Design Miami last month. How does it work? Simple: Each of the hundreds of diodes stands on a metal place, which supplies the tiny amount of electricity needed to power each cell. The designers call it Light Culture, a reference to the fact that the glass box makes the diodes look like cell cultures in a petri dish. According to Emanuelsson and Bischoff, it's as though they've been "carefully bread and nourished protected by the glass cover for scientific study of the led illuminants inherent characteristics."